Police have arrested a man and a woman on suspicion of conspiracy to murder, Scotland Yard has announced. Both individuals, aged 29, have been taken into custody at a south London police station. 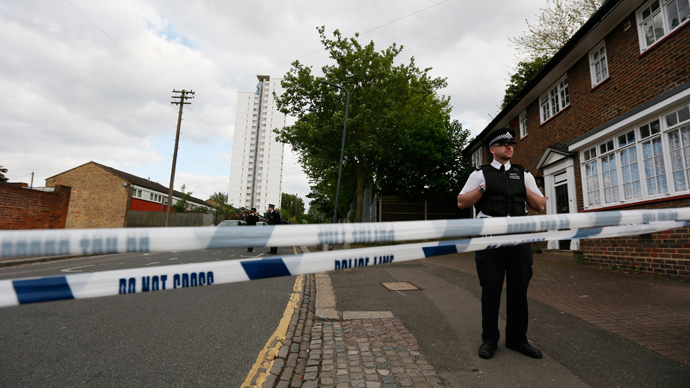 Detectives from the Counter Terrorism Command arrested a 29-year old woman at a residential address in south London on suspicion of conspiracy to commit murder, Scotland Yard said in a statement released on Thursday. A 29-year-old male was also arrested on suspicion of conspiracy to commit murder as a part of the police investigation into killing of a soldier identified as 25-year-old Lee Rigby. Scotland Yard has yet to release the identity of either person. “They remain in separate London hospitals and are both in a stable condition. Their injuries are not life threatening,” the statement continued. 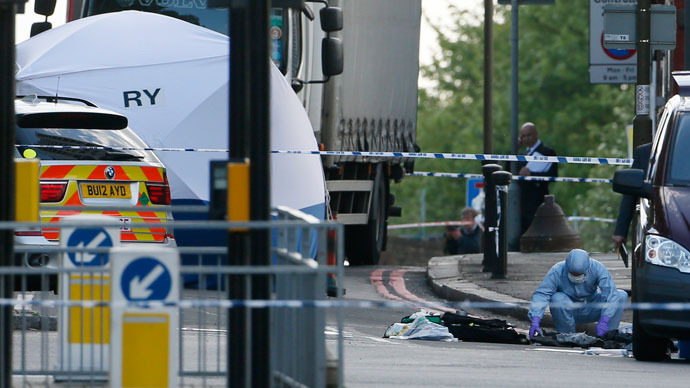 One of the alleged assailants has been identified as 28-year-old Michael Adebolajo, UK media has reported. Adebolajo was said to come from a devout Christian family, but converted to Islam when he finished college. Adebolajo and another assailant allegedly ran down an active-duty service member in a car and then got out and hacked him to death with knives and meat cleavers in southeast London on Wednesday. "We must fight them as they fight us. An eye for an eye, a tooth for a tooth,” says the assailant. It is still unknown whether it is Adebolajo that appears in the video or the other suspect. 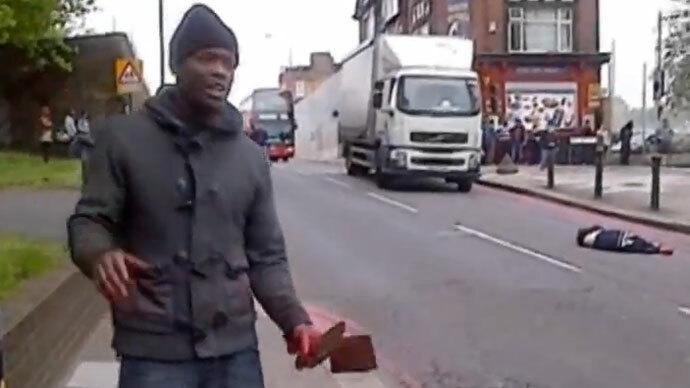 However, Anjem Choudary, the former leader of the banned Islamic group Al Muhajiroun, says he recognized Adebolajo as the suspect who could be seen brandishing a cleaver in the video which was widely circulated immediately following the grisly attack. Choudary says he has not seen the man in two years, but he remembers the alleged attacker from meetings and lectures, saying he went by the name Mujahid. As far as Choudary “was aware,” the suspect was a “normal, practicing Muslim” who was concerned about Muslim affairs worldwide. Founded in 1983, Al Muhajiroun was infamous for attempting to justify the 9/11 attacks and propagating Islamist rhetoric in Britain. Adebolajo was also known to hand out radical leaflets which both promoted radical Islamic ideas and condemned UK military involvement in Iraq and Afghanistan from a stall on Woolwich High Street. His parents, whose home in Lincolnshire was reportedly raided by police today, are said to have moved Adebolajo away from East London over fears their son was becoming radicalized, a onetime friend told the Evening Standard. “He was a Christian. A nice, normal guy. All his friends were white and used to go round to each other’s houses all the time,” a former friend told the daily. A Twitter user named Abu Nusaybah claimed to know Adebolajo and have “grown up with him.” He said Adebolajo had become a very strict Muslim and begun memorizing parts of the Koran to the letter. Witnesses described how the attackers ran over a British soldier and then set on him with butcher’s knives in broad daylight on a busy street. They then paraded around boasting of what they had done and asking people to take pictures of them, before charging at armed police, outnumbered and outgunned. James Heneghan told LBC radio how he and his partner witnessed two black men attack one young man around 20 years old who was wearing a ‘Help for Heroes’ T-shirt. “They were hacking at this guy, chopping him, cutting him, like he was a piece of meat. Then they stood around waving knifes and a gun, asking people nearby to take pictures of them as if they wanted to be on TV or something,” he said. Ingrid Loyau-Kennett, a mother of two and a Cub Scout leader from Cornwall, told the Daily Telegraph how she fearlessly confronted one of the two suspected killers after the attack had taken place. She said that when she first saw the victim lying on the street she thought it was an accident, but then realized he was dead when she could not feel a pulse. It was revealed on Thursday that both of the alleged assailants were part of earlier investigations carried out by MI5 – Britain’s internal security service. However, intelligence services assessed that neither suspect posed a threat to life, Sky News reports. British Prime Minister David Cameron said the Intelligence and Security Committee would carry out a full probe to determine whether or not there were any failings in the run-up to the attack. Following reports the two suspects had been part of a previous probe, Cameron noted the media reports, but said he was unwilling to comment on an ongoing criminal investigation. Cameron add that “after an event like this it is natural that questions will be asked about what additional steps can be taken to keep us safe." The prime minister had earlier decried the “unjustifiable” Woolwich killing as an attack on the British way of life and a betrayal of Islam. In a public address, Cameron vowed Britain would not back down in the face of extremism. 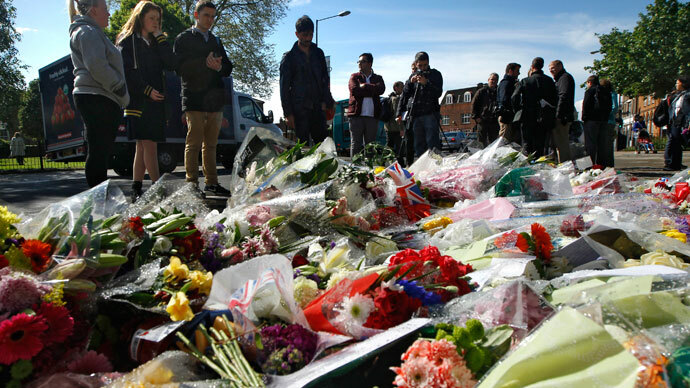 The Muslim Council of Britain decried the attack as “truly barbaric,” and said it will no doubt heighten tensions on the streets of the United Kingdom. “We call on all our communities, Muslim and non-Muslim, to come together in solidarity to ensure the forces of hatred do not prevail,” they said. The two suspects were injured by police fire when they were apprehended, and have spent the night in separate hospitals; one is reportedly in serious condition. They will remain in custody pending questioning. The UK government has stepped up security in the capital following the murder of the soldier, who identity has not been revealed. The Metropolitan Police have deployed an extra 1,200 officers to patrol the streets and places of worship in a bid to reassure local communities. “This calls for new kind of cooperation, new kind of strategy for the international community,” he added. The Tsarnaev brothers, the suspected perpetrators of the Boston bombings, have not yet been linked to any larger terrorist organization and are believed to have acted independently. Both brothers had lived in the US for a number of years before carrying out the attack, which has come to be known as an act of home-grown terrorism. While both attacks represent instances of isolated acts of domestic terror, the specific method used to carry out the south London attack has caused it to resonate on a level not generated by the Boston bombings, William Jacobson, a clinical professor of law at Cornell Law School, told RT. “Obviously Boston caused a lot of injuries that were every bit as gruesome, but Boston was a more ‘traditional sort of attack’ with bombs, etc. The Boston bombers certainly had enough hatred in them [to carry out the attack]. They resorted to the more traditional, standoffish sort of terror," Jacobson said. On Thursday, US President Barack Obama offered his support to the UK, saying: "The United States stands resolute with the United Kingdom, our ally and friend, against violent extremism and terror." "There can be absolutely no justification for such acts, and our thoughts and prayers are with the family of the victim, the police and security services responding to this horrific act and the communities they serve, and the British people."